We all love food: cooking it, eating it, talking about it. This blog is dedicated to those who are interested in food in all its forms and cuisines. This is meant to be a lively conversation between friends so please join in with your thoughts – and even your own recipes. Welcome! Vicki and I fell in love with croissants as students while we were attending McGill University in Montreal. Living in the student ghetto just to the east of campus, we had ready access to La Pâtisserie Belge, which at that time was on Sherbrooke Street, just west of Park Avenue (this was in the days before the PQ came to power so some street names were still in English). Many Sundays, I’d crawl out of bed early and take a run down there to pick up a bag of hot-out-of-the-oven croissants. They were unlike anything I’d ever tasted. The owner made them himself and they were crisp on the outside, tender and buttery on the inside. With a cup of fresh-brewed coffee, we felt like sophisticated Parisiennes as we read the Sunday paper and listened to classical music. 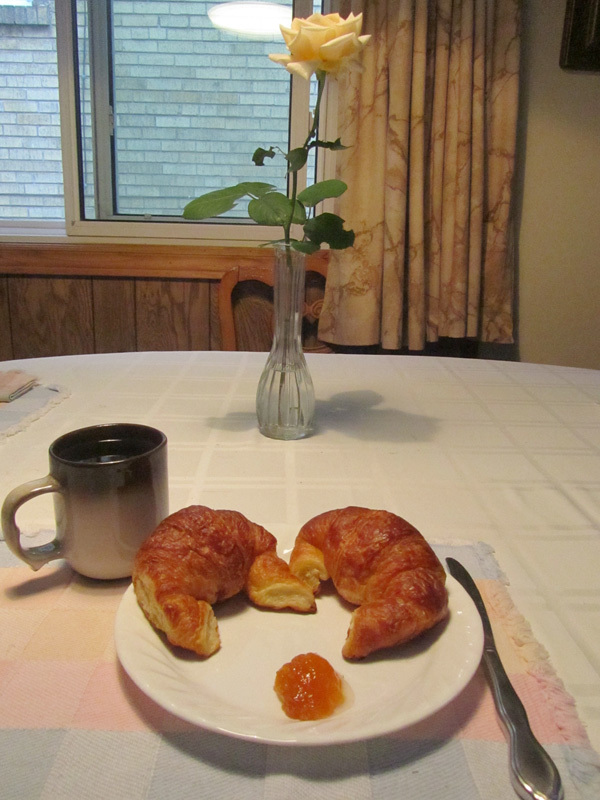 After we moved to Toronto, I kept my eye out for croissants as good as I was used to, and was always disappointed. Memory is seldom accurate. Bad things seem to get worse in our minds as time moves on, and good things get better. I began to suspect this was the case with my croissant memories from university. Then I went to Montreal for a TV appearance, went looking for Belgian Pastry and came upon a furniture store where they’d once been located. I asked a friend, and he told me they had moved up Avenue Parc (as it was now called) and were still open, although the old baker was long gone. His family now ran the place. I went there, bought a croissant and bit into it. It was all right, but when I asked, I found it had been made the day before. With no oven handy, I couldn’t get it heated up, so I couldn’t be certain, but it was sort of close to my university memory of croissants. In 2008, we went to Paris for nine days to research a novel I was writing (The Fallen One) and I was looking forward to finding really great croissants again. Ultimately, though, I was disappointed. We did have some very good ones, but none could meet the bar which had been set in my memory very high indeed. You see, a truly perfect croissant has to be very flaky and somewhat crisp on the outside. The “horns” should be more crisp at the ends with a satisfying crunch when you bite into them. The center should be yeasty, flaky and light, with a real buttery taste. Spread with a bit of apricot jam, I am in heaven when I have one. I left Paris somewhat frustrated. If I couldn’t get one here, where could I possibly expect to find The Perfect Croissant? A bit of a detour here. Let me start with this statement which I’m certain most Frenchmen would argue vociferously with me on: Croissants are not French. They were invented by the other master bakers of Europe, the Viennese (who are also responsible for Danishes, believe it or not). The story goes that when Austria broke the siege of Vienna in 1683, and the Ottoman Turks were routed, Vienna’s bakers stayed up all night making crescent-shaped pastries to celebrate the victory (it was a reference to the crescent on the Turkish flag). These early croissants were called Kipferi. Obviously superb, the recipe quickly spread all over Europe. Whether the story is true or not, it’s lovely and the first baked goods of this type are certainly traceable back to Vienna, regardless. We were in Vienna twice for novel research (Cemetery of the Nameless), and sadly, I didn’t find what I was looking for there, either. So for many years, we didn’t eat croissants. Why be disappointed? Almost every supermarket and doughnut shop sells them now, and those a generally truly bad, even when “refreshed” in the oven before serving them. Toronto has an excellent small bakery, Frangipane, on Dupont Street. The owner makes lovely cakes and pastries, is a superb chocolatier, and also has croissants. We bought some on a whim, put them into a 350° oven for about 8 minutes to crisp them up while the coffee brewed, and wonder of wonders, they were, in a word, perfection. Every time we were in the area for a chiropractic appointment, I’d make sure to stop by to pick some up. Then the owner changed the hours and they were never open when we had an appointment. Horrors! In talking to her once and saying that we missed having our regular croissant fix, she revealed that she didn’t make them. “Too much work!” She bought them from another Toronto bakery/restaurant, Patachou. They’re located on Yonge Street and were once part of what is affectionately known as “The Five Thieves” (an explanation of that will come some time in the future) just below the Canadian Pacific rail line that bisects Yonge Street south of St. Clair. They’re now a bit further down the road at the corner of Yonge and Macpherson. Of course, I immediately went over there and bought some fresh from the source. I was in heaven again! Now, every Saturday, on our way to St. Lawrence Market for our weekly shopping, my son Karel and I stop at Patachou for croissants. I like the plain, he prefers the cheese ones, and they also make ones with almond paste or chocolate (pain aux chocolate which is a square of croissant dough with semi-sweet chocolate on the inside). On Sunday morning when Vicki finally stirs, I start the coffee maker, turn on the oven to 350° and pop the croissants (stored overnight in a seal plastic bag to keep them fresh) into the oven to reheat and crisp up. Eight minutes later they’re ready when I remove them from the oven sizzling slightly. My favourite apricot jam is made by St. Dalfour in France: Tartinade De Luxe Abricot Extra. I like it because it’s not too sweet, and still tastes wonderfully apricot-y. Most jams have too much sugar, so that’s the first thing you taste. I want to taste fruit! This jam is sweetened with concentrated grape juice, and is perfect in my opinion. It’s also not too hard to find, but probably not in your local supermarket (although it is in our small one across the street, luckily). If you’re in Toronto and desire the perfect croissant, head on over to Patachou. I guarantee you will not be disappointed. Heat them up, though! This is critical if you want to experience croissant perfection. If you’re not in Toronto, I wish you luck in finding what you seek. Let me know if you have your own source for the perfect croissant where you live. Rick has been cooking ever since his mother went on holiday back in 1967, leaving him and his brother on their own with a nearly empty refrigerator. From these desperate beginnings, he developed a keen interest in all things culinary and went on to work in restaurant kitchens during university and after, learning as he went along. He and his wife, the lovely Vicki, have a well-equipped kitchen, a long list of their own recipes and a real love of experiencing all sorts of cuisines and ingredients – especially sourcing food as locally as possible, starting with their own backyard, where they have a small but vibrant vegetable and herb garden, plus two apple trees, a peach tree, and grape vines. Rick also is a writer of crime fiction (11 novels and novellas so far) and musician of note, so he has a full dance card. Oh yes, and he’s a huge baseball fan. Visit the other two blogs in which he currently participates: typem4murder.blogspot.com and lateinnings.blogspot.com, or you can find out more about him and his interests than anyone could possibly want to know via his website: rickblechta.com. On the first Monday of any month, you can catch Rick playing trumpet with The Advocats Big Band at Seven44 Restaurant & Lounge in Toronto. Rick also leads and plays trumpet in Toronto’s premiere classic soul band, SOULidified. 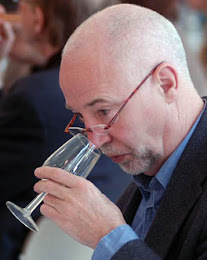 Award-winning journalist Frank Baldock is a wine writer and educator, wine judge and consultant, and three-time President of the Wine Writers’ Circle of Canada. At The Toronto Star, as well as being the Wine Columnist, Frank was a Senior Editor on the National Desk, the Foreign Desk, and the Business and Entertainment departments. As Features Editor of Canadian Living, he helped launch Food, a short-lived but glorious Canadian equivalent to Bon Appetit. As Executive Editor of TV Guide, then Canada's largest magazine, Frank introduced Wine, Food and Sports to improve its 800,000 weekly circulation. As Consulting Editor, he helped launch Metro, the 180,000-circulation free daily in Toronto’s newspaper wars. At the Ontario Ministry of Economic Development, Trade and Tourism, Frank launched its flagship business magazine Challenges. At Telemedia Publishing, Frank developed new magazines from concept to launch. His newspaper career spans the Montreal Star, Toronto Telegram, the Calgary Albertan, as crime reporter, and The Sheffield Star. He publishes Wine Express and his website is www.winexpress.ca. ©Copyright 2012-2019 by Castlefield Media. All rights reserved. Simple theme. Powered by Blogger.